Does your medical device contain animal or donated human cells or tissues? If so, you must meet complex regulations before you can market your device in the United States. 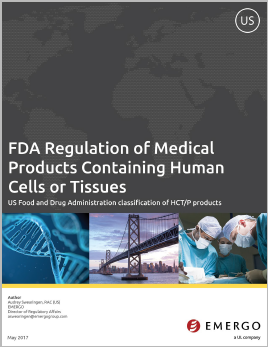 How does the US FDA regulate HCT/Ps? How are HCT/Ps classified by the FDA? What is Tissue Bank Establishment registration? Learn all this and more in this 6-page white paper. Audrey Swearingen is Director of Regulatory Affairs at Emergo's Austin, Texas headquarters. With over 20 years of experience in regulatory affairs, Audrey’s areas of expertise include US FDA medical device registration as well as European and Canadian device registration. Information current as of January 2017.